The crew at Ginowan either heads out to prayer on Friday nights or goes out witnessing at Mihama. Either way it is an exciting night. This week Vunder is hosting the team out to Mihama. We pray for the salvation of the lost. It was a blessing seeing the Diaz' and Pastor Tim at the cafe. They came down for a visit and Joel went out to lunch with them. Please continue to pray for the Nago crew. God is doing a good work. Keegan and Logan got their official status today. The formalities became official! Next stop their Gaijin cards. We are super blessed to see what God will do next in their lives as they serve Him full time. Sam is our newest intern. He comes to us via California where his father is a Pastor. Sam is a real blessing. God has good things in store for his life. Please pray that God will give him clear direction in his life. We are going to miss her as she heads out to the Pastor' wives conference in Murrieta. Joanna will be gone for two weeks so they are going to have to hang out with dad. Don't worry mom, they will eat well. The Neely's are leading worship together and they did a great job. The rest of the band was Rockin. Check out Tatsuhiko on the base. Michal on vocals, a good lookin worship band. Many of you know Pastor John and Tom Greenroyd; this is an earlier picture of the Greenroyd family but I just found out that the brothers are heading to a missions trip October 30th through November 4th. Please keep the Greenroyd's in your prayers as the Lord leads them on this exciting trip. God has great things in store for them. These are two good brothers who have a heart on fire for the Lord! Check out those plates. Zach and Karimata can throw em down. Eating sushi in Fuchu is a big deal. If you can't run with the big dogs, stay on the porch. Mr. Lacar from Christian surfers Ryuku gave us the opportunity to come and be a part of their outreach at Sunabe Seawall. We had a great day of eating and surfing. Shoyu chicken, mac salad and rice. A blessed time of fellowship. After the men's breakfast we spent some special time in prayer praying in detail for Chuck and Yumi's move to Tohoku. God is doing a special work in their lives and we are excited for them. Please join us in prayer for the Robb's. Pastor Jeremiah from Machida in Mainland Japan spoke this week at our lectures class. He has been ministering in Japan for some time now and he is preparing to move with his family down to the Kagoshima area. Also he just celebrated his 41st birthday. Happy Birthday Pastor Jeremiah! This is what the cafe looks like three times a day as we gather for meals. It is a time to "catch up" with the days affairs. Bible College is a great way to serve the Lord. Pastor Tim regularly attends a meeting of the local Pastor's in Nago. The reason I am blessed with this picture is seeing the younger people there. If the Gospel is not passed onto a new generation of young people it will come to an end in Nago. Tim and Eder have an important, great work ahead of them. Since Monday was our day off and the mini typhoon was passing by us we decided to take the crew out for "all you can eat" BBQ. There were 21 of us and we almost took over the whole restaurant. It was a good time. Tropical Storm Roke has turned into a larger typhoon as it passed Okinawa. We barely felt its effects as it passed by the East of us. But as it passed by it has gained some big steam. It will hit mainland Japan as a category 3 and then will travel up to the Sendai area about a category 2. So it will bring a lot of rain and wind, please pray for the safety of the Japanese people as the mainland is not as prepared for a big hit like Okinawa. God bless you! It was a great honor to license Andrew Neely as one of our Pastor's here at CCGinowan. Andrew has been such a faithful witness, leader and loving husband, as well as an example of a man of God here in Japan. The Lord's anointing is upon this man and we just want to confirm that anointing and calling by licensing him as a minister of the Gospel of Jesus Christ. Please continue to pray for this man of God. Zach and some of the Japanese Pastors went out to the hospital to visit Pastor Dan. Please pray for him, his heart is not working well and he is waiting for a heart transplant. Please join us in believing for a complete healing. Saturday evening I was able to get in a session at Bowls (Sunabe enterance). Towards the end of the session the sun was going down and it was absolutely beautiful! Nice evening, then fried rice at the Dragon. This Friday morning we were blessed to have Pastor Travis with us teaching our lectures class. It is a blessing to be able to have these Japanese Pastors share in encouragement for the students. She is doing well at Murrieta, involved with a lot of worship and ministry at the school and church. Please continue to pray for Hannah, for the continued leading of the Holy Spirit in her life. I try to meet weekly with the interns at the Bible College as well as some of the church leadership. We are going over the book "Spiritual Leadership" with Oswald Sanders. It is a good night of fellowship and training. Today we celebrated Madison's special day. We are so blessed with the people that God has brought to us this semester. Please pray that they become all that God wants them to be. 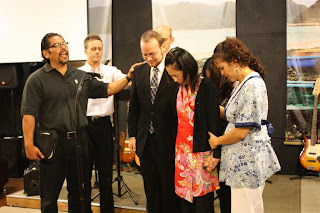 Keegan also got approved today from immigration to become a missionary here at CCGinowan. We are blessed to have him being a part of the Ginowan clan. The Koinonia Dinner was off the chart tonight. People brought incredible dishes tonight. Everyone was so blessed. The Japanese dishes as well as the unique variety was so delicious! Thank you everyone for blessing us all. The next step Logan goes to immigration and gets his visa stamp and becomes an official missionary of CCGinowan. Congratulations Logan, to God be the Glory. The Okinawan newspaper printed an article about our w2 service. We had a concert and special prayer for the 10th Anniversary of 9/11 and the 6th month mark of the Tsunami that hit mainland Japan. It was a good night for the glory of the Lord. There is a little storm that is forming in the ocean near Okinawa. Please join us in prayer that it will stay a tropical storm. We can always use the rain, but the heavy winds we can do without. "Thank you Jesus for the rain, please keep us safe from a large storm, in Jesus Name, Amen". We were able to take the gang out for the day sightseeing. So blessed to have some special guests with us. Bryon from Mainland Japan, David from New York, Micah and Alicia from Hawaii. A good crew having a good time. Yoshua's grandfather was saved as a young boy right after WWII. He became a Christian as a result of a Pastor here in Okinawa who shared the Word of God with him. His grandpa eventually became the pastor of that church. Yoshua's father is now a Pastor here in Okinawa (Livingwater church). Yoshua was a "lying scumbag" (exact words) then he got saved 5 years ago. He will graduate from CCBC Okinawa this semester. He is well on his way following in the footsteps of his Grandpa and Dad. God is amazing! At w2 we spent time praying for the people and Nations affected by this tragedy (the world). Also it has been 6 months since the tragedy of the Tsunami in Japan. We also prayed for the children in the midst of these tragedies. The drummer for "Inside Story" intense man, he's got the look, the grit, he's got the Spirit. Rockin out! I haven't heard a drummer in a long time. Go for it man! Mr. Vee brought down his band to play at w2 (Worship/Word). It is a night of worship and prayer. It is also the 10th anniversary of 9/11 as well as marks the 6th month anniversary of the Tsunami that hit mainland Japan. We will be spending time in prayer and reflection. The gals gathered at the Ruiz home for dinner and fellowship. They had a blessed time getting to know each other. We have a wonderful group of gals at CCGinowan. Hannah facetimed me today and Pastor Cisco was there with her, so she put him on the phone. It was great being able to tall to my brother. He is doing good but please continue to pray for him for a quick healing recovery. A group is at Mihama witnessing while a group gathers here at the Ruiz house. Prayer is the key that opens the doors to new ventures of faith. It is always good to see a house full for prayer. It was a blessed trip to serve in Hong Kong but it is always a blessing to be back at home. God gives vision and direction, all we have to do now is just flow in the Spirit. God has great things in store for us here in Japan. While I was at the Hong Kong airport I Face-timed Hannah and she called me back. She was setting up the mics in the sanctuary getting ready for chapel. Hannah is involved with worship as well as serving in AV for the Bible College in Murrieta. She just finished up one of her Block classes and she did well. She is having a good time serving the Lord and learning the Word of God. We miss her here in Okinawa but we are super blessed that she is doing so well at School. Please continue to pray for her, that the Lord would lead, guide and direct her path. Technology is incredible! At the Bible College here in Okinawa we did our first ever video lecture. 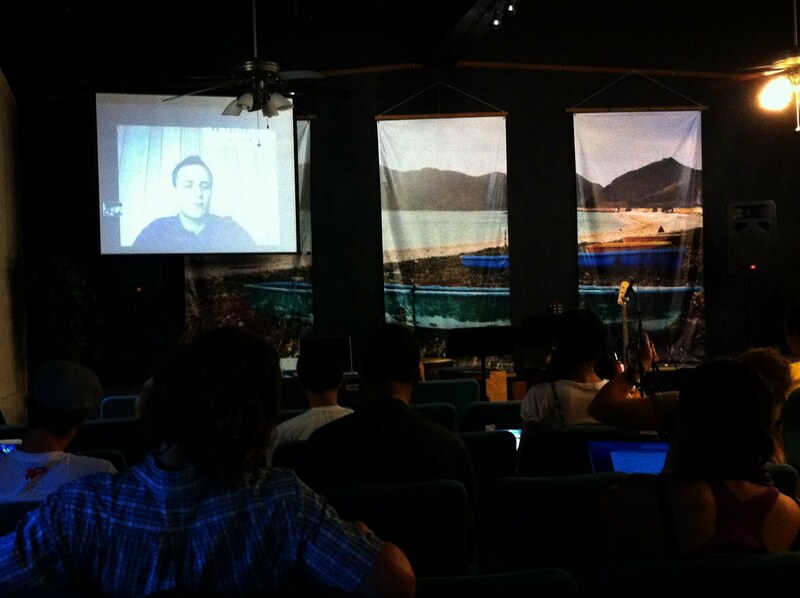 Pastor Tim in Nago city, called in on skype and we had a lecture for the students. Lectures in Ministry is the class so we will have different Pastor's and speakers either live or calling in via skype. This opens up huge doors for us. Praise the Lord! If is time to leave Hong Kong and head back to Okinawa. The conference was great, the fellowship was wonderful. It was good to get the guys involved in worship and Pastor Phil was blessed with their service. Good job guys! To God be all the Glory! The guys left at 5am, and the streets were erie this early in the morning. No one was out and the walk back to the hotel was creepy. Like after the rapture just happened, but when that happens the streets will be filled with confusion. To take a taxi cost 300 HKD (40USD) the city bus only 33HKD (4USD) this is the cheapest was to travel back to the airport. Michael and Zach were blown away at the streets. They said that they are more packed than Tokyo. I told them "no way" they said "yes" because there are people all over in every street not just in one place. It really was some wild shopping. We went through the shoe district and we have never seen so many Nike stores in our lives! Look at the background behind Michael, beautiful! (I wish I had my paddle board) It was a fun afternoon but now back to Kowloon, back to our hotel and last minute shopping before the guys head out at 5am. It is beautiful on the south side of the island. So peaceful and serene. So different from the other side where everything is GO, and people are hustling and bustling about. We were here for a couple of hours and then took the bus back to Mong Kok. Before heading out to the backside of Hong Kong Island, we decided to eat at another local join. This time we went to a place that was packed out. And it was worth the wait. The lunch special was awesome! Mike is mackin down on some good fried rice. The guys from Korea are heading out. They had to leave the conference right when it finished. Off to do ministry in the land that they love. Thank you Daniel and Pastor Mike for all the blessings and service at the conference. God bless you all! There is a storm that is brewing out in the Pacific. It looks like it will not hit us in Okinawa but will you join us in prayer for a light storm that would not cause any of the countries in our area to suffer damage or loss of life. It is just a tropical storm so that is looking good for all of us. Pastor Phil Twente finished off the conference with one last teaching and Communion. It has been a blessing for all of us. We are ready to go back home to our countries where we serve. "God please give us vision, give us direction, lead us in the Power of the Holy Spirit". I first met my brother Rudy 5 years ago here at the missions conference. He has been serving the Lord in India for over 10 years. Five years ago Rudy had a vision for a printing press, the Lord blessed him with a press, he learned how to run it and to this day he is printing tracts and missions material in the local language. Praise God, the Lord is using Rudy and God has blessed him in that in January he will be marrying his beautiful India(n) fiancé. The guys have done a great job of leading in worship. Beginning at 6:30am for the prayer time to the late evening afterglow. These guys are servants of the Lord. Thanks guys for taking the time to serve at the conference, everyone was blessed. Pastor John Chubik taught again the last night of the conference. It has been a blessing to be here and a part of the work that God is doing in Asia. There are a good group of people who are serving in this part of the world. Please continue to pray as we "go into all the world".